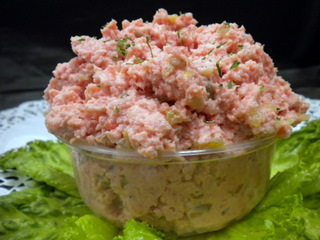 This restaurant recipe for Ham Salad can be used for sandwiches or salad or an appetizer spread. This page has the restaurant recipe provides the product for serving these. Restaurant guests order this item frequently for both uses whenever I put the sandwich or salad on the restaurant daily special sheet. 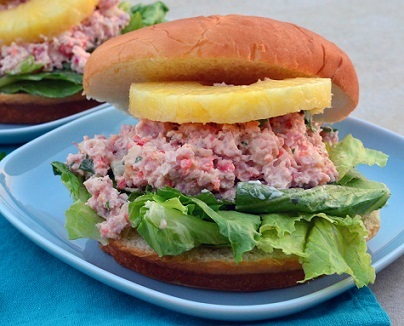 There are many recipes for ham salad, but this is an all-time favorite. If there is a secret to this restaurant recipe, it is the dressing. The recipe calls for a bit of honey as well as stone ground mustard. You can also use this to stuff fresh tomatoes. Add some pineapple or top the spread with a slice of pineapple. Yummy! These are great ways to enjoy the last of a ham you baked. If used as a salad, the recipe has about 5 grams of carbohydrates assuming 6 servings or about 4 grams of carbs for 8 servings. Try serving on honey-wheat bread with lettuce, tomato and mayonnaise. Option: Serve this on a fresh baked buttermilk biscuit. Butter and place in a medium warm skillet until warmed through. 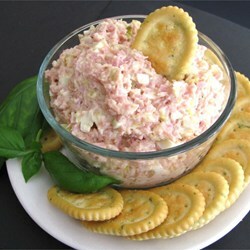 Spread the biscuit with the salad mixture and arrange on a platter to serve. There you have your restaurant recipe for a either a delicious salad or sandwich. Thanks for your interest in cooking with confidence and style. With these restaurant recipes, you can! Enjoy your restaurant salad recipe and the company of those you share it with! Did you know? The William Underwood Company, founded in 1822, was an American food company best known for its flagship product, Underwood Deviled Ham, a canned meat spread.